Last in a series of four articles examining challenges facing the University of Massachusetts. Built atop a garbage dump across the street from a dilapidated housing project on an otherwise barren peninsula, the University of Massachusetts Boston has long aspired to provide the city’s working class, its immigrants, and others for whom college seemed out of reach with a solid liberal arts education. Nearly 50 years after its founding, it has fulfilled much of that vision — serving more minority students and first time college-goers than any other UMass campus — but still lags in other ways. Twelve percent of entering students graduate in four years, and only 41 percent earn a degree in six, a lower rate than at any other UMass campus and at many other urban col leges around the country. Located on the opposite end of the state — and academic spectrum — from the flagship campus in Amherst, UMass Boston has long been viewed as just good enough, university officials said. Adequacy, not excellence, remains the prevailing public perception. Now, as leaders of the multi-campus University of Massachusetts attempt to lift the state system into the upper echelon of public universities, the Boston campus finds itself pulled between its historic mission of providing broader access to a college education and its current ambition to improve the caliber of its students, its facilities, and its academic offerings. UMass Boston was temporarily housed in Park Square when it enrolled its first students in 1965, and relocated to Columbia Point a decade later. Now, ambitious plans are in the works to overhaul the crumbling campus, in part by building its first dorms to attract more out-of-state and international students and the added revenue they bring. The university is also expanding its honors program to cater to high-achieving scholars and adding doctoral programs to raise its profile, and the amount of grant money it receives, as a research institution. For the UMass system to improve, some officials say, its largest commuter campus must stop acting like a community college, with relatively open admissions. The school’s demographics — a stew of adults juggling jobs and families and many young people from impoverished backgrounds — make it difficult to achieve the same academic measures as other UMass campuses, say faculty and administrators. Its entering freshmen have the lowest SAT scores and grade-point averages in the UMass system. Ill-prepared for college, 16 percent of new students end up doing remedial work; by comparison, at UMass Lowell, no students take remedial courses, because the university has begun steering those students to less selective state universities and community colleges. A quarter of UMass Boston freshmen never make it to their second year, about the same rate as at comparable big-city public universities, but much lower than at all but one of the other UMass campuses. As UMass Boston tries to polish its image, some UMass officials question whether some of the students even belong at the university. 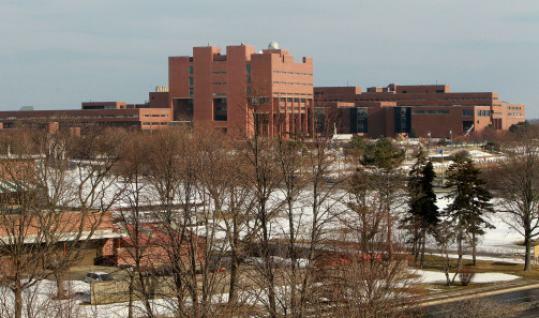 The Boston campus, a formidable brick fortress on Dorchester Bay, is the system’s fastest growing university. It’s also the most diverse, enrolling at least twice as many minority students as any other UMass campus. For many of them, college represents a hope, not an expectation. Each spring at graduation, on the grassy circle in front of the campus center, a particularly moving scene occurs that UMass Boston faculty and administrators say symbolize what the university does. The chancellor asks all who are the first in their families to graduate from college to stand up. About half in the sea of caps and gowns rise in triumph. Some long-time faculty worry that UMass Boston — facing increasing pressure to raise its reputation — will turn its back on those it has historically served. Building dorms, community The most visible sign of change at UMass Boston will be the addition of dormitories. The campus — which school officials say is the only urban public research university in the country without student housing — plans to open two residence halls, with the first 1,000 beds scheduled to be available as early as 2013, and another 1,000 beds by 2018. University officials hope the dorms will help UMass Boston attract higher achieving students looking for an urban residential college experience, but also eager to save money. Tuition and fees at UMass Boston are $10,600 a year, less than a third of nearby Northeastern and Boston University. Student enrollment has risen nearly 30 percent in the past six years, to 15,500 undergraduate and graduate students, and is projected to increase to 20,000 by 2025. But some faculty and alumni fear that the plan for dorms signals a transition at UMass Boston, from serving older students who have no affordable research university option to serving more middle class college students. Some faculty say that older students, with their diverse life experiences, differentiate UMass Boston from other four-year colleges and enrich classroom discussions. “Dorms will divert attention away from the students we really should be paying more attention to, students who make sacrifices to be here,’’ said Tim Sieber, an anthropology professor. Even without dorms, the average student age has dropped, from 30 years old in 1996 to 25 today, driven in part by students’ search for lower-cost educational options, and by the construction of nearby rental housing. More than half of undergraduates are now under 22, compared to 43 percent in 2004. More than 60 percent of students surveyed by the university say they would like to live on campus. Some now commute up to two hours each way to get to class. Buttlar is among approximately 1,500 students — 10 percent of the student population — who have already moved within walking distance of campus in recent years. About half live in what was once the troubled Columbia Point housing project, which has since been converted into the mixed-income Harbor Point apartments. The other half live in a pair of new apartment buildings, seven and nine stories high, next to the university’s parking lots. Both complexes function as de facto dorms. At one of the buildings, private security personnel regularly patrol the hallways for noise and signs of underage drinking. But students who live there say the apartments are no substitute for real dorms. The difficulty of forging a community makes it harder for the university to address its academic challenges. Students are more successful when they feel connected to their college campuses; research has shown those who live on campus report higher grade-point averages and graduation rates. That phenomenon has driven an increasing number of urban universities, including Queens and Brooklyn colleges in New York City and the University of Michigan in Flint, to add or expand student housing in recent years. Pressures over funding When UMass Boston was founded in 1964, its trustees hoped that Boston and Amherst would someday be the twin pillars of public higher education in Massachusetts. Boston would be to Amherst what UCLA is to Berkeley, two equally strong public universities at opposite sides of the state. But, many say, it’s now too late, given the state’s historical lack of support for the public system. UMass Boston’s supporters say the Legislature never invested as much as it should have in the campus, in part because of political pressures from private college leaders leery of more competition. “Because of the private campuses around here, public higher education was never able to flourish in the same way as in California or Michigan or even Florida and Texas, even when there were resources,’’ Uriarte said. There was tension, too, between the flagship campus in Amherst and the urban campus in Boston, and that tension persists in an era when state support is ever more limited. Amherst, which receives half the money that the state gives to the UMass system, is now struggling to improve its own reputation and academic profile, increase the number of tenured and tenure-track faculty, and boost alumni support. Each of the three other undergraduate campuses — Boston, Dartmouth, and Lowell — is also trying to raise standards and improve their reputation despite declining state support. Under the budget proposed by Governor Deval Patrick for the next fiscal year, state appropriations for the UMass system would drop from $10,028 per student in 2008 to $7,121, UMass officials said. UMass Lowell has seen some recent successes after it brought more freshmen into dorms — more than 66 percent of first-year students now live on campus, compared to 57 percent three years ago — and organized them in small groups that also take courses together. In the last five years, the percentage of freshmen who came back for a second year at Lowell rose from 74 percent to 81 percent. UMass Dartmouth, where only 73 percent of students return after their first year, more than doubled the number of student beds in recent years, but that has not done much to help its retention rates, said Chancellor Jean MacCormack. Instead, she said, the campus will focus on making students feel more connected to faculty and peers interested in studying the same subjects. Adding programs, facilities UMass Boston’s campus overhaul has been a long time in coming. A parking garage that doubles as a foundation for many of its buildings was closed in 2006 after it was deemed structurally unsound. Years of exposure to salty sea air — and construction fraud involving political bribes and the use of low-quality concrete — had caused leaks and chunks of cement to fall. That well-publicized fiasco of the 1970s still serves as a symbol for the long neglected university. “We prop the thing up and we keep on going, because we’re stuck with it,’’ said Rachel Rubin, chairwoman of the American studies department. But now, a watercolor sketch illustrating plans for a better UMass campus rests on an easel at the entrance to the chancellor’s office, next to an aquarium filled with African Malawi fish. The university plans to begin building a state-of-the-art science center in June, its first new academic building since 1974. More classroom buildings will follow. And in place of the crumbling parking structure, Motley plans to construct a grassy quad that will be as big as Harvard Yard. “We want to be a research institution of note,’’ Motley said. Despite the physical changes, Motley said he is committed to UMass Boston’s historical purpose of serving the city and its students. To improve student success, the university has begun to experiment with building small communities for freshmen, grouped by majors and career aspirations. Their professors monitor their progress closely, and offer help at all hours, even by text message. Early results are promising. Of the 46 students in the program last year, 87 percent stayed for a second year, compared to the overall freshman average of 75 percent. The university also hopes to double the number of students in its honors program to 500 over the next five years. UMass Boston is also in the process of adding eight to 10 doctoral programs, in fields such as developmental brain sciences and applied linguistics, to increase the number of graduate students as part of an effort to transform the school into a major public research university by 2025. Administrators have also put pressure on faculty to bring in more federal research dollars. Research funding generated by the university has already more than doubled, from $19 million in 2001 to $51 million in 2010.